New 2016 decks and mattresses! 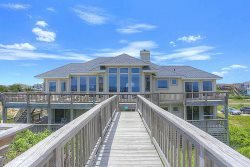 Sea Watch is a beautiful four bedroom, ocean front retreat in the Southern Shores of the Outer Banks. The home is in an ideal location to make the most of your time on the Outer Banks. Sea Watch is close to beach shops, restaurants with local flavor, fun area attractions, and of course the gorgeous beach. Sea Watch has direct beach access. You'll be digging your toes in the sand after a short stroll from your back door. Located in the Pelican's Watch complex in Southern Shores, you will find yourself within walking distance to great restaurants, shopping, and the fishing pier. Sea Watch is gorgeous both inside and out. The home is impeccably decorated down to the finest detail. Gorgeous furnishings and decorations give the home a warm, inviting feel, helping to produce a great vacation atmosphere. The kitchen flows into the dining and living areas making meal times a fun group event and creating a great space to stretch-out and relax with loved ones. The proximity to the beach is ideal. Direct beach access is a short stroll from the home, and Sea Watch offers private ocean front balconies (master bedroom and living room) perfect for taking in the tranquil Outer Banks setting. Sip your morning coffee while you enjoy the gorgeous sun rises over the Atlantic, or unwind with friends and family under a sky bursting with bright stars. In addition to the direct beach access and stunning views, Sea Watch also offers access to the community pool. Need more than one home? PW20 is right next door in the Pelican's Watch complex. Reserve one of the few remaining weeks today, and bring the beach to your back door at Sea Watch. Second Level: Queen master bedroom with walk-in shower and private balcony, bedroom with two twins; queen bedroom and a full bath.